Black holes aren’t really holes. Rather, they are lots and lots of matter so close together that the escape velocity, or the speed that it takes for matter to escape, is higher than the speed of light. In order for a ball to escape the Earth’s gravitational pull and go into orbit, one must throw a ball up into the air at a speed higher than 11.23 km/sec. For one to throw a ball up into the air and have it escape the gravitational pull of a black hole, one must throw the ball up in the air at a speed greater than 300,000 km/sec. In the analog universe, black holes are made of matter, which has gravity and pulls more matter towards it. In the digital universe, black holes are made of information, which has equal gravity and pull. Once enough information is placed into a database, all things are self-similar; the macro universe is the same as the micro-universe, or the universe existent within the confines of our hard drives. With the increase in hard-drive storage comes a bevy of related problems. When data no longer exists in a tangible, 3 dimensional state, does it really exist anymore at all? Furthermore, data can only be displays an image or text file at a time on the two-dimensional surface of a computer monitor. A few experimental headways have been developed in order to take care of the problem of seemingly chaotic, high velocity data. In Digital Memories in an Era of Ubiquitious Computing and Abundant Storage, Czerwinski and her research group tell the story of a man named Gordon who is searching through photos he took. However, he’s associated new levels of data with the images so that they can be more easily found. For instance, he can filter through photos by the temperate at which they were taken. When looking for an image of the Sydney Opera, he recalls that he saw it on a hot afternoon. With this knowledge and the metadata he’s attached to the photos, he is able to search his photo library for pictures taken in environments with a temperature higher than 80 degrees. He can also filter out images by geography, so images not taken in Sydney, Australia can be removed from the library. These types of filtering mechanisms will become increasingly important. One of the problems with Gordon’s photo library is that it is not a public one. If his library were to be public, he would have a much greater set of metadata. An entire website of people might begin to organize his photos into meaningful sets. Once data is released out into the world, it becomes easier to manage. Like images are attracted to like images, and tags and sets begin to appear. From general to very presice, images that are uploaded seem to always find a place. 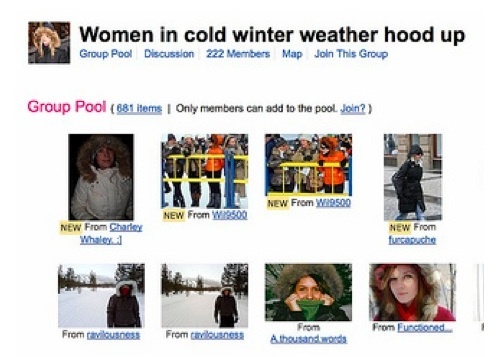 Like this one – “Women in cold winter weather hood up”. The idea of having a group with such specific interest aggregating all of the images on Flickr that fall under those specific terms would not be possible before tagging. The idea of tagging a piece of data allows it to be indexed and found, even though it may be attached or uploaded in a decentralized way. The time and space required to actually visit museums limits views and discussion of photos. Releasing the photos out into the world allows a much wider audience and appreciation. The library of congress recently released their photos of Flickr, and he Brookyln Museum has archives of uncopyrighted material with explanations of their sources. When museums began uploading photos to Flickr, patrons were able to access versions of the museum experience without having to be there. 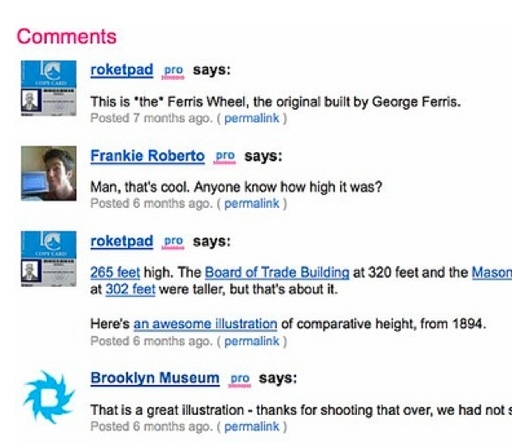 Often, visitors to the Flickr site would contribute vital historical information to the comments about historical photos. Without wider access to photos, that information may have been lost. Some sources were unknown, but Flickr users showed the way. They often added additional tags to photos and sorted them into specific groups. This brought another layer of history into circulation that might have otherwise been left in the back room of the library or museum in which they ended. Museum space is also limited, and using Flickr to showcase documents allows a museum to suddenly have much more space in the digital realm. Many historical photos have very high view counts, and comments also contain debates about what the photos include. The debates include people from many age groups and walks of life. People are able to meet around these photos and bring formerly auditory opinions into text. This is not to say that one should browse Flickr over visiting a museum, but that the medium of Flickr has extended the capabilities of museums, increasing accessibility. Flick users have become curators. Open museums releasing photos on Flickr is one example of making data accessible. With Flickr, everyday experiences become documents -- capable of being visited again and again. But there are still issues with retrieving data in an over-saturated world. One of them is actually getting the data out of the computer and into the real world, so that the object has weight, shape and mass. It then becomes an analog social object. We are told we were very formal in the past through what remains of cultural history. Since advertisements were more prevalent and widely spread than personal photograph, we’re more likely to believe that everyday experience and culture was a certain way. Historically, it was figures of power that had written histories, but now, those with access to technology can also write their history. We can see that a lot of it is not formalized. A lot of it is not perfectly polished. A lot of it is little bits of truth that would be difficult for anyone except the most exemplary poets or writers to be able to write. But if those poets or writers did write truthfully about this era, then their words might not be read by much of the population, just as the majority of people in history did not read the historical documents or works of great authors. The difference between the history recorded then and the history recorded now is that one’s history can be understood by another – often without the need for words. The image and video allow a quick way to hear the words and thoughts of many others without having to travel, but these words and thoughts are not sponsored thoughts, but real, actual thoughts. Thoughts without the need to sell a product. Once digitized, We also cannot touch data. we cannot feel its weight. Printing out all of the material stored on one hard drive would make a stack of paper a mile high. But if we add 400 megabytes of images, we do not feel our computers getting heavier. Instead, nothing changes. When we close the photo browser, or the folder containing those photos, those photos disappear. Where do they go? They are invisible. They go into another space – the space between computers and networks. They are compressed and flattened into our hard drives, and we do not see or feel them again until we tell the computer to open them up. This creates various problems. Once digitized, data is stuck in the bordered confines of the pixilated, digital picture frame. Monitors range from 13”-30”, and often take time to plug in, turn on, and load data that is contained within them. Methods of access become increasingly difficult when too much of the same data is located in one space. The individual value of data also decreases when it is too easy to create data in the first place. The most prevalent example of this is digital photos. Digital cameras are capable of taking increasing amounts of photos. The history of taking photos began with portraits, usually commissioned by royalty, to represent an important family member or potential alliance through marriage. When photography became available, pictures were accessible to an increasing mass of people, but photos still took quite a lot of time to take. With the digital camera, the amount of time to take a photo is reduced to milliseconds, and the amount of space proportionately reduced. Photo-making no longer belongs to the space of the dark room, but any nearby computer monitor. Limitations to photo-making occur after a set of digital photos are taken and uploaded. Once transferred to the computer, the photos exist in the black hole of a hard drive. They must be sorted and loaded, and lack the tangible, haptic quality of an actual paper photograph. If preserved, they must be transferred from hard drive to hard drive, operating system to operating system. Storing photos on a CD is much different than storing photos in an album, which may be flipped through at leisure. To make photos tangible again, they must be printed. However, printing takes a significant amount of time and money. In fact, there is more time and space involved in rendering digital photos back into a tangible, analog format than the time and space involved in taking the photos in the first place. It is as if the hard drive is a black hole, or an object with significant mass that attracts many particles of data. Getting the data out of the black hole takes a certain escape velocity. Flickr is a successful website because it has provided a social space for files previously compressed into a hard drive. It provides a connection across many of the black holes that so many of us have on our hard drives. If black holes of data bend time/space inward, towards the invisible compressed area of the hard drive, then the only way to get it out is another time/space compression – one of upload. One where hard drives are so compressed that they can compress no further – where they begin to squirt out into the cloud – to social sharing sites, and Flickr. Flickr is an example of a system that allows photos to be shared, tagged, and accumulated through tags and identity. These tags allow like photos to be searched and grouped together. The ease of use that Flickr creates for users when uploading and tagging files makes it an increasingly popular destination for data that is stuck within the confines of a hard drive. The Flickr website is an invisible, ubiquitous co-created space that operated under natural laws of order from chaos. In a sense, Flickr has become a global photo album, with formerly closed storage devices opening themselves up to a larger, lighter, database. This cloud of photos exists everywhere that Internet can go, and bits and pieces of it can be accessed as long as one has the requisite interface, i.e., a browser window and Internet connection. Each additional upload informs the overall order of the system. This page was last modified on 26 November 2010, at 18:27.